GlobeNewswire: Synaptics announces an exclusive partnership with OXi Technology, a Shanghai-based developer of optical fingerprint technology. The collaboration includes combining technology from each company in the development of new proprietary optical sensing solutions for smartphones, tablets and PCs. Synaptics has signed an agreement to make a minority investment in OXi and expects the investment to close within a few weeks. Further details of the agreement are currently confidential. GlobeNewswire: Synaptics announces an industry-first family of Natural ID biometric authentication solutions that leverage optical-based fingerprint sensors for smartphones and tablets. 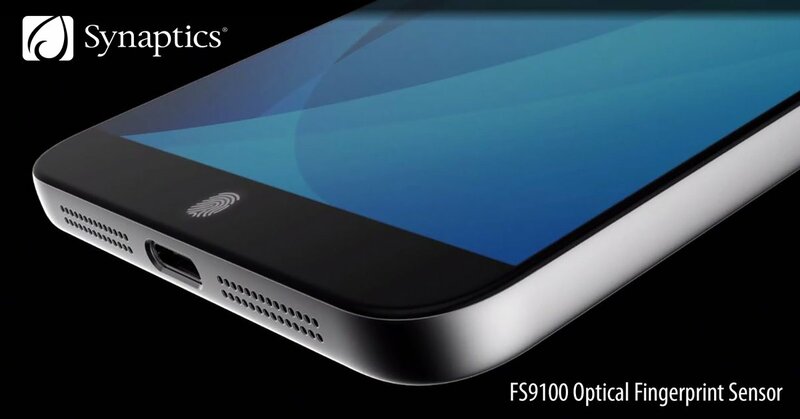 The new Synaptics FS9100 optical fingerprint sensor family is capable of high-resolution scanning through 1mm of full cover glass and enables clean, button-free industrial designs. Under cover glass biometrics eliminates button cut-outs and glass thinning processes required by capacitive under-glass sensors, leading to glass yield improvements. The optical solution also excels with wet finger performance, and being protected by glass, is durable, scratchproof, waterproof, and eliminates ESD concerns. The FS9100 sensor leverages unique Synaptics optical technology developed for mobile devices and breaks through key technical barriers with an extremely thin form factor and minimal power consumption. The new sensors are scheduled to sample in early CYQ1 with mass production in CYQ2. TOT is a glass-based Thin Optical Touch Technology. Fingerprint image is captured by light sensitive pixels. Reflected by human finger through the cover glass, photon converted electron signal then be digitized by our specially designed high speed, low noise 16 bit A/D circuit. Such data is processed by our unique image process technology and transformed into sharp and clear image. Why 16-bit ADC is needed for fingerprint sensing please? They should use some kind of pinhole array to collimate the light to a CMOS sensor like Vkansee. Rumor said that they use ML/CFA process to do this. But the use of optical collimator has been patented long long time ago and should be in public domain now.